Like a lot of my crafting hobbies, my vinyl collection had gotten out of hand. I was resorting to a Rubbermaid tub with the vinyl rolled up in giant rolls inside, but it looked like a Rubbermaid tub wrestling an octopus with all of the vinyl sticking up and fighting it's way out. It was time to get it under control. First, I looked at vinyl racks. I LOVED them, but at $54 a pop for the small ones that wouldn't even hold a quarter of my vinyl, I had to pass. Next, I considered building my own. I thought about a giant thread rack with dowels at an angle. However, I don't have a drill press and with my OCD-like tendencies, I knew that any imperfection would drive me batty and I'd never finish it to my liking. Then.... pegboard. This seemed to be my best option. I could always paint it to pretty it up, but I like super-simple, non-busy things. Right next to the pegboard was a gridwall. BINGO! Before ordering, I measured my wall. I had a 2' x 5' section that was just perfect for vinyl storage. Luckily, gridwall comes in all kinds of sizes. I knew that I wanted 3 baskets. One to hold supplies, one for scraps, and one for my specialty vinyl. So I ordered 3- 12" x 12" baskets. (They narrow at the bottom, so a 12" x 12" piece will not lay flat in the bottom, but it still works for me.) I also wanted to be able to hang up my tape that I would use to secure the rolls, so I got a 2" peg. 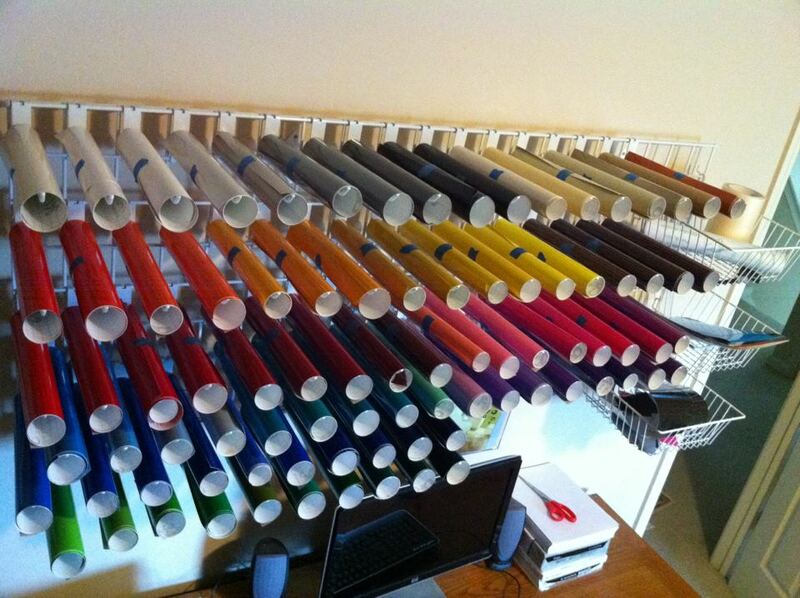 For my vinyl color chart and samples, I ordered an 8.5" x 11" acrylic literature holder. Finally, of course the vinyl pegs... I purchased 90- 12" long pegs. I always order my vinyl in 12" long sections anyway, so this fit perfectly. It was super-easy to install. I was able to do it on my own with my handheld drill. Make sure you mount it into the wall studs so it's nice and secure. After taking this picture, my order for my 12" x 10-yd rolls came in. I was able to put them on the gridwall as well, just double up the hooks to help support the roll. I'm really happy with the way it turned out. It makes the vinyl easily accessible without being "in-your-face". Looks fantastic and I have to say that I am buying EXACTLY this for my craft space. Thanks for making not have to use my brain! Love it! Came over from the ATS group on facebook. Of all the MANY vinyl storage ideas I've seen, this is by far the best. And SO cheap compared to some of the others! I LOVE it and I'm definitely ordering a similar setup ASAP. Thanks so much for sharing in such detail!! Love this! How do you keep your rolls from unrolling? There is non-sticky tape sold to wrap around embroidery thread to keep it from unrolling. It comes on a roll and can be cut any length you need. I think this would be awesome for this. It does not do any damage. Thank you so much! I pinned this to my "Honey Do" pinterest board which I share with my handy hubby and much to my delight, he ordered it for me for our anniversary! I can't wait for it to arrive. What a great way to store vinyl. Thanks for sharing!!! What is the website to order from? Store supply warehouse (www.storesupply.com) has WAY cheaper shipping option! (I don't work for them, I am simply a customer) Shipping was over $50 cheaper than KC Store and Supply Store Warehouse have a huge selection as well. KC Store Fixtures offers the largest selection of Gridwall and Gridwall accessories at the lowest prices. Please visit our website at www.kc-store-fixtures.com or call us at 800-862-0899. We look forward to helping you! Your system looks fantastic. I just got home from Embroidery/Applique conference and the guy told us we should store our vinyl in plastic to keep from getting dust on it. 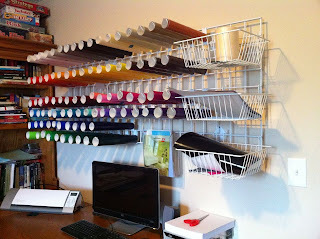 This would work like my thread peg board that I have clear vinyl over to protect thread. Has anyone tried this with longer vinyl rolls? I have 20" rolls. Thank you for this great idea! It is exactly what I need to keep my etsy shop growing. I looked everywhere for a vinyl organizer and all were to expensive and didn't offer everything that I needed. 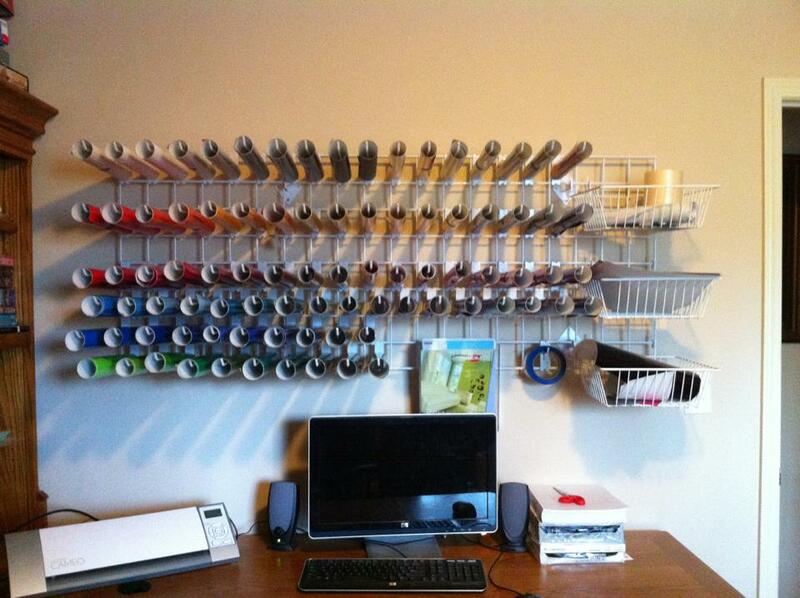 I ordered with your suggestions and can't wait for it to come in so I can get organized!!! Thanks again! I just found this and it looks great. Do you think it would work for 24" vinyl rolls? Using Shelving Racks on that not be a good option! What do you think? WOW this is awesome!! 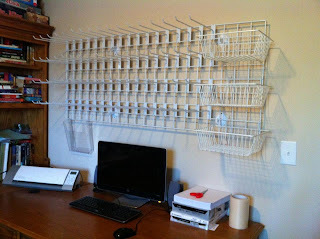 Such a wonderful way to organize your vinyl and things! !